“Our mouth is not separate from our body. 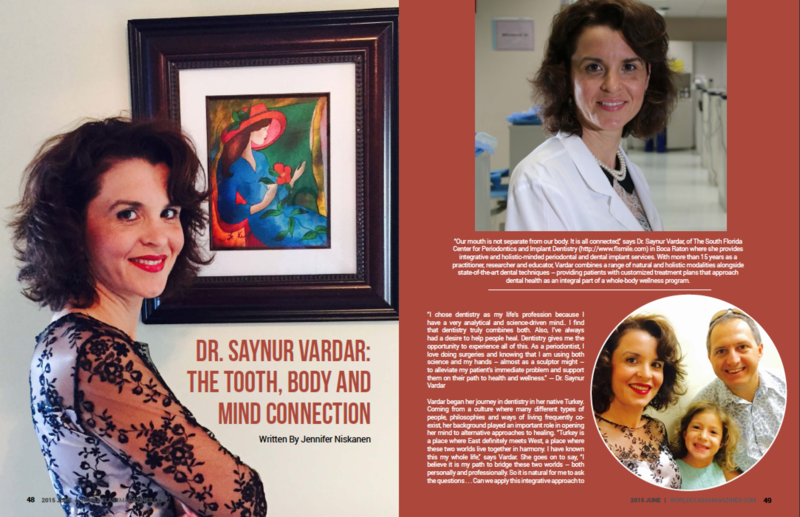 It is all connected,” says Dr. Saynur Vardar, of The South Florida Center for Periodontics and Implant Dentistry (http://www.flsmile.com) in Boca Raton where she provides integrative and holistic-minded periodontal and dental implant services. With more than 15 years as a practitioner, researcher and educator, Vardar combines a range of natural and holistic modalities alongside state-of-the-art dental techniques – providing patients with customized treatment plans that approach dental health as an integral part of a whole-body wellness program. After coming to the United States and practicing conventional dentistry and periodontics for several years, Vardar herself became sick and personally experienced both the frustrations of a strictly allopathic path to wellness, as well as the healing benefits of an integrative approach. “I was diagnosed with 10 different diseases, and left the medical offices with no answers, many questions, and a bottle of pills. I went to numerous specialists, and every one of them suggested that the cause of each illness was something totally separate from the others. There was no one who could connect the symptoms, and give me a more satisfying ‘big picture’ answer,” says Vardar. So she started searching for answers elsewhere. She began looking at her lifestyle, her emotions, her environment and any other factors or imbalances that could contribute to her condition. She changed her diet, did cleansing programs, increased her yoga and meditation, began to exercise daily and got rid of as many negative influences she could – and started to feel healthy again. As she moved towards a more balanced, healthy, fulfilled, lifestyle, her health improved. With all-natural approaches, she says she became a balanced, energized person again. Changing what she ate, how to breathe, how to relax, how to detox — and putting back what her body was missing – cured her. She started taking classes on integrative and functional medicine. She became a yoga and meditation Instructor. She became certified in hypnotherapy. She started working with other health care practitioners who were committed to integrative, holistic medicine. And as she learned more and more, she started sharing her discoveries with her patients. Eventually, this led her to the concept of integrative dentistry and the practice she has today. Vardar argues that chronic diseases are increasing at a crazy rate, “Right now, 47 percent of the U.S. population has periodontitis, which is a form of gum disease that causes bone loss around the teeth and 47.7 percent of Western populations have at least one chronic illness such as diabetes, cardiovascular disease, rheumatoid arthritis, etc.” From a holistic perspective, chronic diseases are lifestyle diseases, so if a person with a particular lifestyle has diabetes, then they are more prone to have cardiovascular disease. Vardar wants to empower her patients to understand that their lifestyle creates their health, and it is their responsibility to control it. The connection between the mouth and the rest of the body is something Vardar spends a lot of time educating her patients about. She warns that infection travels through the blood stream, as well as on inflammatory molecules. Once it gets into the circulatory system, it can get into organs and other tissues. Oral bacteria can travel through the body and is sometimes found in the plaque in the heart. During the last 15 years, there has been a lot of research on this connection and the increased risks of heart disease and poor oral health. Vardar also emphasizes the energetic connections between the mouth and the body. As well as traditional periodontal techniques and treatments, Vardar uses homeopathy, energy medicine, hypnotherapy, breathing techniques and electromagnetic bio-regulation devices to help the body better heal itself and regain natural balance. She also uses nutritional support because she believes that whatever you eat is what you become. She recommends an anti-inflammatory diet to improve conditions in the mouth and encourage healing. “People see and experience the positive and health-affirming results of a holistic approach, and they want to learn more about these alternative options,” she says. Vardar’s integrative approach also extends to the materials she uses such as metal-free, Zirconia implants and a de-emphasis on conventional painkillers. Instead of chemicals and pharmaceuticals, Vardar primarily uses homeopathic preparations, which she asserts work via energy and vibrations –without side effects or drug interactions. She suggests material testing for different materials, and decisions about procedures like root canal treatments are evaluated based on the patients current medical status and the extend of infection. Vardar says that the heart of her life’s mission is to “live a conscious life and share her experiences.” If someone has never experienced the rewards of an integrative holistic approach to their health, then she considers it an opportunity to open the door to this concept. By helping her patients to look at and manage their periodontal health as a mindful, whole-body experience, then Vardar is satisfied that she has done her job. And if any of her patients are not yet ready for this model, then she is still happy to plant a seed in their mind for the future. For more information about Dr. Saynur Vardar and integrative dental services contact 561-912-9993.